Balcón del Valle Corneja rural house with: five rooms (3 double rooms and 2 double rooms), five bathrooms (EACH ROOM HAS INDIVIDUAL BATHROOM), fireplace, garden, barbecue gazebo and biosaludable circuit. A Tórtoles de la Sierra, where the house is located, is known as "Balcón del Valle Corneja", from where fortunately the most striking views of the bright and multicolored VALLE are contemplated. Protagonist, the Corneja River that with its generosity downstream bathes canyons and banks succeeding one after another the centennial and very aged flour mills. Tórtoles, my town, is the original prototype of the small Castilian mountain villages, faithful to their tradition while preserving the rural magic that with its aromas and mountain air is an ideal excuse for the enjoyment and rural rest. 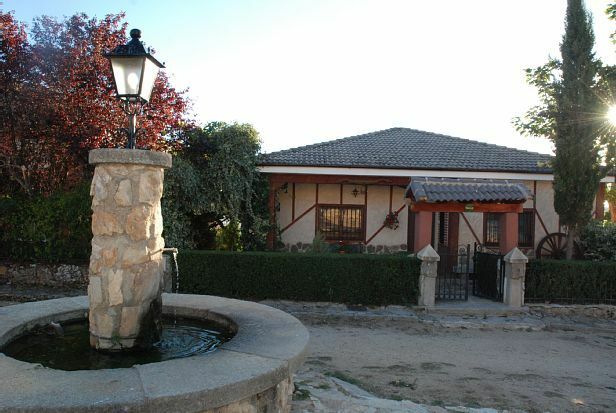 If you decide to live it, this is your rural house: Balcón del Valle Corneja. - Next to the house, a fountain whose spring comes from Cerro la Jarilla. Its water is recognized as of maximum quality by the neighbors of the town. - Bread and pastries at the door of the house around 12:00. Interesting hiking trails, but especially interesting is the climb to the JARILLA that can be seen visually from the porch of the house. The time spent approximately on the route is two hours to go up and down. From the climax it is an unforgettable joy. The owner guarantees the cost of firewood, both in the fireplace and on the barbecue. - Next to the house, a fountain whose spring comes from Cerro la Jarilla. its water is recognized as of the highest quality by the residents of the town. - High definition television (HD) - Small playground and exercise machines for seniors - Bread and pastries at the door of the house around 12:00. Interassing hiking routes employed approximately two hours in up and down. From the climax it is an unforgettable joy. All rooms have bathroom. Picnic in the garden. The owner guarantees the cost of firewood, both in the fireplace and on the barbecue. Christmas Eve is also rented. Buenas noches,muchísimas gracias, habéis sido ejemplares en todo. Conoceros , ha sido un placer, mucha salud. En lo que a la casa respecta hemos quedado muy contentos. Está muy bien equipada, es muy cómoda y hemos estado muy a gusto. Los alrededores también muy bien para pasear. Bonilla es un pueblo precioso que está muy cerca para ir y volver caminando. Y el trato con el propietario estupendo. Es una casa muy recomendable y a la que volveríamos. Fin de semana en Familia!! Estuvimos alojados en la casa un total de 8 adultos y 5 peques. La casa es perfecta. Muchísimo gusto en la decoración y no le falta detalle. El entorno es precioso y sin peligro para que los peques puedan corretear por las calles del pueblo. Mencionar a Jose Luis "El Panadero", muy atento todos los días para traernos el pan a la misma puerta de la casa. Y como no destacar la amabilidad y hospitalidad de Miguel siempre predispuesto para todo. Nos quedamos con ganas de sacar mas partido a ese pedazo de Jardín, pero el tiempo no acompañó. Así que esto nos sirve como excusa para volver!! Muy buena casa, trato inmejorable. Estupendo lugar, buen fin de semana. La casa espectacular. Gracias Miguel. Gracias Miguel, no puedo empezar de otra forma. Ha sido un fin de semana genial. La casa tiene todo lo que puedes necesitar para pasar unos días estupendos con tu familia y amigos, habitaciones grandes y cómodas, cada una con su cuarto de baño, columpios por todos lados, equipada hasta los dientes y bien cuidada. Hemos disfrutado con la chimenea, con los alrededores y con las vistas de la casa, inmejorables. Miguel, el dueño, nos ha hecho sentir como de la familia y sino que se lo digan a mi hijo, que no le soltaba de la mano como si fuera su abuelo, por cierto, Javier te manda un fuerte abrazo. Ya estamos pensando cuando vamos a repetir, tenemos que probar esa magnifica barbacoa. Un gran fin de semana en esta casita rural, muchas gracias por todo, un saludo!